A graduate of San Jose’s Mount Pleasant High School, Matthew attended college at Fordham University’s Rose Hill Campus in the Bronx, New York. An eight-time Academic All-American and four-year varsity starter on Fordham’s Division I men’s water polo team, Matthew graduated from the Fordham College Honor’s Program with a double major in Political Science and History. After college Matthew returned to his hometown of San Jose to attend law school at Santa Clara University. 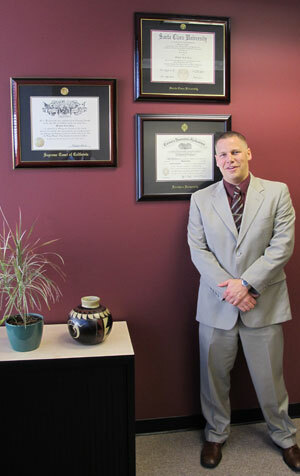 It was there that he discovered his passion for family law and through his work at the Katherine and George Alexander Community Law Center that he first realized his desire to work directly with clients to obtain practical results-oriented solutions to real world problems. A recipient of multiple awards for receiving the top marks in his classes, notably in Family Law and Estates and Trusts, Matthew accepted a position with one of the South Bay’s premier family law firms following his graduation from law school. In this capacity Matthew gained tremendous experience representing a diverse range of family law clients in a variety of proceedings including, custody and visitation proceedings, child support hearings, hearings on temporary spousal support and permanent spousal support, post-judgment modification proceedings, domestic violence restraining order proceedings and trials on complex property characterization, property valuation and property division issues. Matthew passed the October 2011 Family Law Specialist Exam administered by the State Bar of California, and awaiting the completion of other requirements to establish his standing as a Certified Family Law Specialist. In 2012 Matthew decided to open his own practice dedicated to providing his clients with the best results in the most efficient and expeditious fashion possible. This vision guides Matthew’s practice and clients will often hear Matthew extoll the virtues of performing a cost-benefit analysis before pursuing any course of action. Outside of the office Matthew remains close to the sport of water polo. Having coached both high school and club water polo and high school swimming while in law school, Matthew currently serves as the head coach of the Stanford University club men’s water polo team.